Developers that come up with data recovery tools tell you that should an accident occur, your data can be recovered. But the simple truth of the matter is that data recovery is always a risky game – it’s not foolproof. To make sure you don’t lose your precious data should something go wrong, the best approach is to have it backed up. You can do that with the free Windows application Yadis! Backup. This application will back up your data and thus it will give you peace of mind – peace of mind that, should a data loss accident occur, you have a backup. The Yadis! Backup installation file is little over 1MB in size, meaning it won’t take long for the download to complete. Installing the application won’t take long either. When you’re done with the installation process and you run the application for the first time, you will be presented with a “Welcome to Yadis! Backup” wizard that will guide you through the initial configuration of the backup tool. You will have to pick a skill level, choose if you want the application to automatically run at startup, and choose if you want the application to automatically look for updates. Front and center of the application’s interface are all the backup tasks you created. To the left there are buttons for creating new tasks, editing and deleting existing tasks, and starting and stopping tasks. In the upper right hand corner there’s a dropdown Settings menu. The aforementioned “Welcome to Yadis! Backup” wizard offers to take you to a webpage that explains how to create a standard backup task. Creating such a standard backup task is such a simple matter that I doubt you will need to see the tutorial. It’s as simple as giving it a name and description, picking the data you want to back up and the location where you want to have it backed up, and choosing if you want to start the backup process right then or at a later time. You can also set up Advanced backup tasks. Meant for advanced and expert users, these tasks give you access to filters, file versioning, file monitoring, and scheduling. Yadis! Backup, as mentioned above, is free. If you like the application and want to support it, please note that donations are welcomed. Back up your data so you don’t suffer the nasty consequences of a data loss accident. 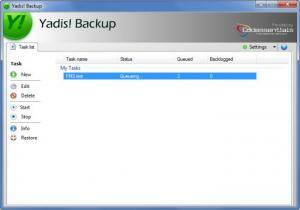 You can do that easily, rapidly and efficiently with the free backup tool Yadis! Backup. It will take little time to get Yadis! Backup up and running. You are presented with a welcome wizard and you are guided to a webpage that explains how to create a standard backup task. There are two types of backup tasks: standard and advanced. Yadis! Backup is freeware. You can download Yadis! Backup free here.